Review posted March 6, 2018. Kane Miller (EDC Publishing), 2017. 28 pages. This is a sweet little story of a dinnertime conversation between a girl and her mother. “And thank you, kangaroos,” said Grace. So begins a progression of people and animals to thank for the various parts of their meal. For example, an alpaca is thanked for providing the wool that Auntie Amber used to knit a scarf that kept Uncle Fred from freezing when he caught the fish they’re eating. Road workers are thanked for fixing the path so they could ride their bikes along the creek all the way to Suki’s stand to buy some corn and kale. The result is a warm and cozy reminder of how many people and animals helped bring them their delicious meal. And the book just might provoke a new dinnertime game of long involved thank yous. And what could be better than that? 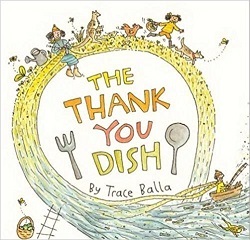 Thank you, Trace Balla, for writing such a warm and joyful book!